One of my biggest thrills working day and night to make our planet a healthier home for children, wild animals, forests, waterways, soils, air and our oceans is meeting extraordinary humans. 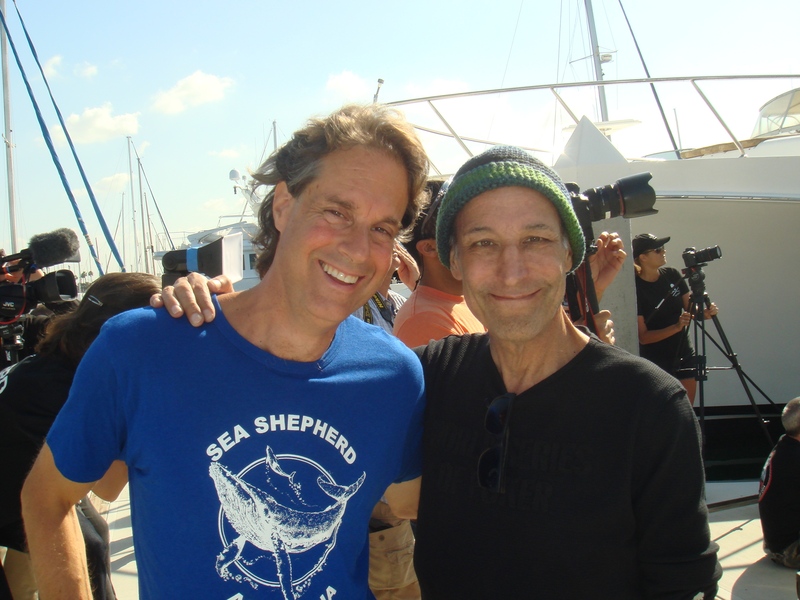 The award-winning television executive Sam Simon is a very special person. The co-creator of The Simpsons truly loves animals. In fact, when I asked him about his favorite animal he told me, "It's a tie between my dogs Gerty and Columbo." 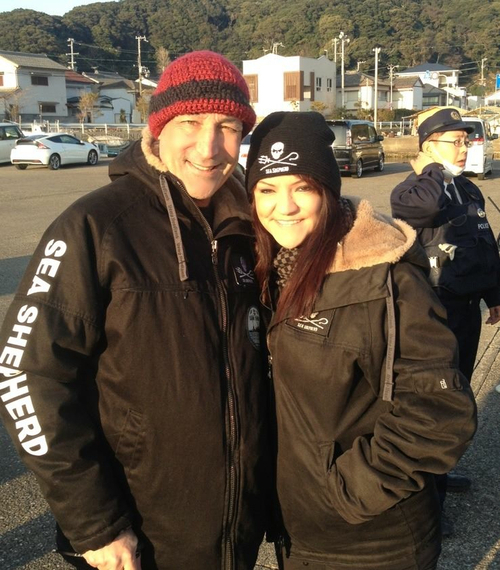 Being a dog-lover that brought both of us an ear-to-ear grin and a terrific way to break the ice and inquire about his recent whirlwind trip to Taiji, Japan as the Sea Shepherd Conservation Society's Honorary Cove Guardian of Operation Infinite Patience. Sea Shepherd's Cove Guardian logo. We both agreed that the ocean-killing annual drive hunt and slaughter of thousands of dolphins, porpoises and small-toothed whales that occurs throughout Japan from September 1 to March 1, must come to an end. Although Sea Shepherd first brought Taiji's killing Cove to the world's attention by filming and releasing now-iconic undercover footage and photographs of hideous captures and the bloodthirsty massacre in 2003 -- the plundering of thousands of these remarkable sentient creatures continues. That's why Simon went to lend his voice of compassion to these tremendous creatures that only show kindness to humans. 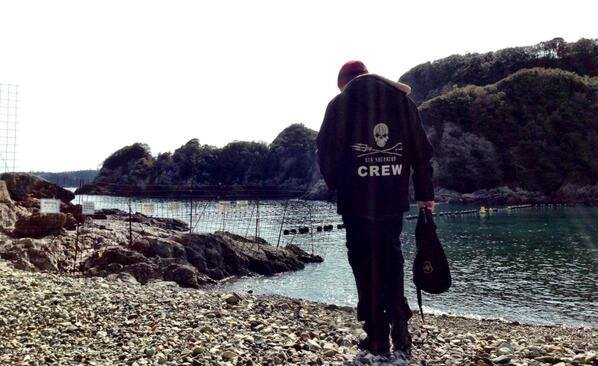 I asked him how we could get Japan to respect life in the sea rather than slaughter it? 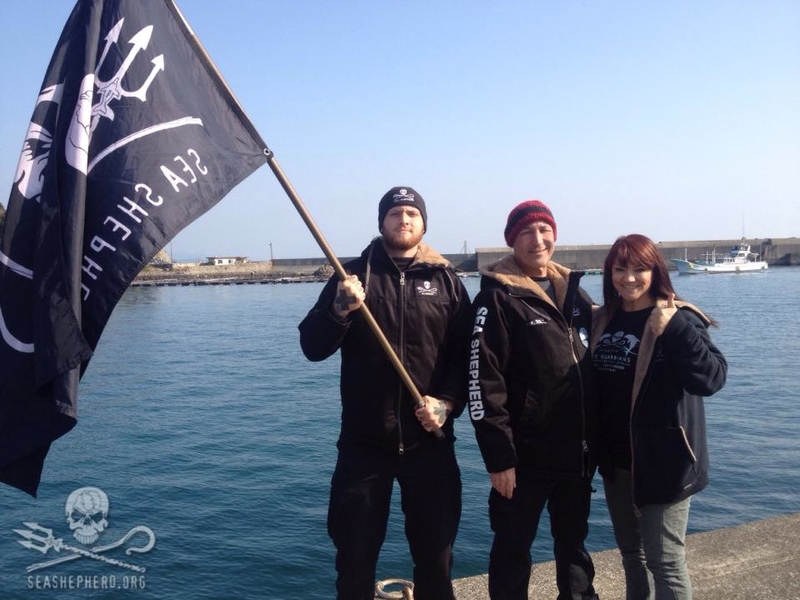 "Sea Shepherd and Sea Shepherd's Cove Guardians believe that external pressure, or "gaiatsu," on Japan from people and countries around the world will be what ends the slaughter of dolphins and whales by Japan. This season in particular, the Cove Guardians have successfully focused international media, political and public attention on the barbaric hunt in Taiji, and this has put immense pressure on Japan to end the hunt as the actions of a few in Taiji bring shame to the entire nation of Japan," said a thoughtful Simon. I pressed him further on how to get people back to nature, to protect her rather than kill her. "We as humans have forgotten the interconnectedness we have to nature and to all life on this planet. As we overfish the oceans and decimate entire families of dolphins and whales at a time, we are destroying the ocean along with them -- an ecosystem that we ourselves need to survive. There are many children, who don't want to see that happen, and they will lead the way, but we all have to do our part and the time to act is now. Sea Shepherd is not just defending the oceans, but safeguarding nature and the planet for future generations," remarked a determined Simon. One of Simon's passions when he's not saving bears in Colorado, feeding the homeless vegan meals, helping children or flying with Pam Anderson (another longtime animal activist) to St. John's, Newfoundland offering $1M to end the annual bloody seal killing once and for all, is playing poker. He's very good at that and those games often run all night. So I wasn't too surprised when, with a child-like grin, he told me that his favorite place to watch a sunrise or sunset was in Las Vegas. The inhumane capturing of dolphins for sale into a dreadful life of captivity to entertain burgeoning nouveau riche Chinese and oil-rich Arabians deeply disturbs me. Simon nodded repeatedly and added, "The bottom line, for the aquarium industry anywhere around the world, is profit. If the demand to see dolphins and whales in captivity drops, so will profit. The captive dolphin trade is what funds and fuels the slaughter of dolphins in Taiji, and anyone who buys a ticket to see dolphins in captivity has the same blood on their hands as the Taiji Fishermen's Union. To stop the demand for captive dolphins, people have to stop paying to see captive dolphins." One thing that struck me about Simon, despite the brutal toll of chemotherapy for colon cancer that has metastasized, was his splendid sense of humor. Humor is a necessity in our world today and Simon is a gifted humorist. I inquired, "How do we engage all children on our planet to protect the dolphins and whales, now?" "Children have an innate compassion for animals and love of nature. I believe there is a way to talk to children about the importance of not harming animals and not taking them from their natural environments. It's important for us to teach them that dolphins and whales don't belong in tanks and that if we love them, we should want to see them free and protected in their ocean home. Sea Shepherd has many enthusiastic young supporters around the world, and they are the future of protection for these animals who play a vital role in the ocean ecosystems," he explained to me. I asked Simon as the Honorary Cove Guardian of Operation Infinite Patience what was his main message: "The slaughter of approximately 2,000 dolphins and small whales occurs in Taiji every single year. 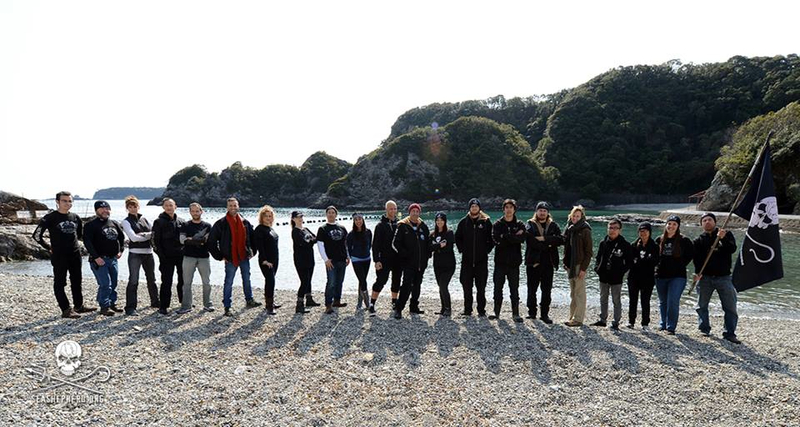 The Cove Guardians are the only group on the ground along the shores of Taiji every day throughout the six-month hunting season, and they document and live stream every capture and every slaughter for the world to see. As the Cove Guardians have documented, the slaughter is horrific and inhumane, and the violent captures for captivity are equally brutal. The sustainability of this hunt is also questionable, at best, as thousands of dolphins and whales are taken from the ocean. These animals are simply migrating past Taiji, and it is hard to determine what devastation this hunt is causing to their populations." Simon loves the ocean, that's why he procured the SSS Sam Simon to help protect the whales in an International Sanctuary in the Great Southern Ocean from the Japanese grenade-tipped harpoon poachers. He fervently believes that, "To save the whales is to save the seas, and to save the seas is to save humanity." Simon has another project very close to his heart. He rescues and retrains stray dogs on his six-acre property in Malibu, Calif. He gives those four-legged friends a new lease on life. Some are retrained as service dogs helping people with disabilities, primarily the deaf. While others help returning soldiers from Iraq and Afghanistan to contend with post-traumatic stress disorder. Simon also offers a free mobile service for spaying and neutering pets with low-income owners. Before leaving for chemotherapy this intrepid man told me his favorite color was "Blue Cove Day" blue -- no dolphins are killed on Blue Cove Day. Lastly, he revealed to me that his favorite music artist is Pink. 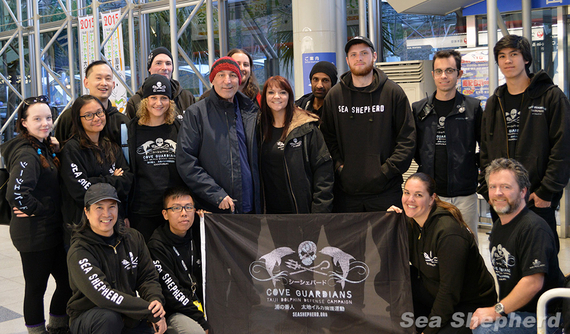 It was a wonderful privilege to meet Sam Simon -- a superhero protecting Earth's Animal Kingdom!